Full Time – 5 days per week term time. Excellent Rated Preschool at The Southport School our specialist knowledge in the education of boys ensures we create a kindergarten program with their needs as our focus. Changes to the National Curriculum mean that more than ever before it is important that all children have the best possible start to their educational journey. Boys who participate in a quality kindergarten program taught by qualified teachers with a real passion and interest in their learning enjoy a flying start to learning and life. TSS Preparatory School offers a Preschool program for boys in which they can grow into their potential. “What a child learns and experiences in their early years … will have effects that last a lifetime.” Give your child the best possible start. Neuroscience shows that early experiences impact upon brain development more than genetics. In other words, nurture trumps nature. Young brain development is dependent on a positive environment – good nutrition, health, and nourishing and stimulating parenting. At The Southport School your son is at the centre of everything we do. Through our Preschool program we want to inspire your son with a love of learning and to give your son a great foundation for the years ahead. Belonging – recognising the knowing where and with whom you belong is integral to human existence, providing a basis for children’s interdependence and relationships with others. Being – recognising and valuing the “here and now” in children’s lives, and viewing childhood as more than simple preparation for adulthood for the future. While the EYLF focuses on children from birth to five years, The Queensland kindergarten learning guidelines aim to specifically enrich children’s learning in the Preschool Year. In Queensland, the Preschool Year is the year before the Preparatory Year of schooling. Throughout the Preschool Year, children’s right to experience the joy of childhood is fundamental and learning is promoted through play, and emergent and planned learning experiences and interactions. The Guideline recognises that parents are children’s first educators and values the vital role parents, carers and family members play in children’s lives and their ongoing learning. The term “families”, throughout the guideline, recognises the range of people who take on parenting roles and build close and supportive relationships with children in their home environments. Identity: Related EYLF learning outcome: Children have a strong sense of identity. Connectedness: Related EYLF learning outcome: Children are connected with and contribute to their world. Wellbeing: Related EYLF learning outcome: Children have a strong sense of wellbeing. Active learning: Related EYLF learning outcome: Children are confident and involved learners. Communication: Related EYLF learning outcome: Children are effective communicators. What will my son learn at Preschool? The TSS Preschool program will be taught by fully qualified teachers rather than child-care workers and each class will be taught by supplementary specialist teaching staff in Physical Education, Music and Life and Faith. A nationally accredited learning framework. By focusing on achieving, maintaining and exceeding best practice, we’re helping to ensure the happiness and health of the children in our care and their families. The Southport School Preschool is housed in a state of the art facility on the grounds of our Preparatory School. Entry is off Benowa Road, Southport. You are cordially invited to visit and see for yourself one of the Gold Coast’s premier early childhood education centres. The Preschool program will be taught either in full-time or part-time mode. The three options are as follows: 5 days per week ( Monday through to Friday), 3 days per week ( Monday, Tuesday, Wednesday) and 2 days per week ( Thursday and Friday). There are a pre-determined number of places in both modes and so register as early as possible is advised. The part-time preschool students will attend for three days in one week and two days in the next. This will be either two set days on Monday & Tuesday or Thursday & Friday and the boys will alternate attendance on each Wednesday. As an accredited centre, for eligible families, the fee for attending the TSS Preschool Program will attract the Child Care Benefit. The Reggio Emilia approach is an educational philosophy started by the parents in Reggio Emilia, Italy after World War II. The parents believed that the destruction of war required a new, better approach to teaching their children. They believed that children form their individuality in the early years of development. The program they developed emphasised respect, responsibility and community involvement. Children were allowed to explore and discover in a supportive and rich environment where the children’s interests helped determine the curriculum. It is unique to Reggio Emilia. It is not a method. Outside of the town of Reggio Emilia, all schools and preschools are Reggio-inspired, using an adaptation of the approach specific to the needs of their community. This is important, as each student, teacher, parent, community, and town are different. No two Reggio-inspired communities should look the same, as the needs and interests of the children within each community will be different. The Reggio Emilia pedagogy views children as capable, inquisitive learners and educators plan experiences, called provocations, to spark creativity, thinking, planning and reflecting in line with the boys’ interests and Queensland Kindergarten Learning Guideline outcomes. Many natural “loose parts” have been added to the classrooms and outside areas to enhance the commercially bought resources. Children are innately curious about the natural world and experiences using natural materials is not only aesthetically pleasing, it is also delightfully open-ended, engages the senses and supports valuable connections with the natural world. To ensure the boys are able to connect with nature authentically, an area of woodland between The Pearson Building and The Cribb Building, called Bush Preschool, has been made available to enable to the boys to explore, create and collaborate. Many readings and professional learning undertaken in the area of Nature pedagogy confirms the importance of nature being a powerful teacher, supporting children to learn about themselves, others and the natural world. Additionally, the Reggio approach involves the whole community and TSS Preschool endeavours to work with not only families but also the wider community to support the boys’ learning. Uncle Boomerang is a regular visitor to Preschool, who talks to the boys about Indigenous culture, much of which takes place in our natural environment around the school. Children are communicators and communication is a process, a way of discovering things, asking questions, using language as play. Children are encouraged to use language to investigate and explore, to reflect on their experiences. They are listened to with respect, believing that their questions and observations are an opportunity to learn and search together. It is a continual, collaborative process. Rather than the child asking a question and the adult offering the answers, the search is undertaken together. The environment is the third teacher and is recognised for its potential to inspire children. An environment filled with natural light, order and beauty. Open spaces free from clutter, where every material is considered for its purpose, every corner is ever-evolving to encourage children to delve deeper and deeper into their interests. The space encourages collaboration, communication and exploration, respects children as capable by providing them with authentic materials & tools. The adult is a mentor and guide who observes children, listens to their questions and their stories, finds what interests them and then provides them with opportunities to explore these interests further. Children’s thoughts and learning processes are documented through many different “visible” ways in a respectful manner. 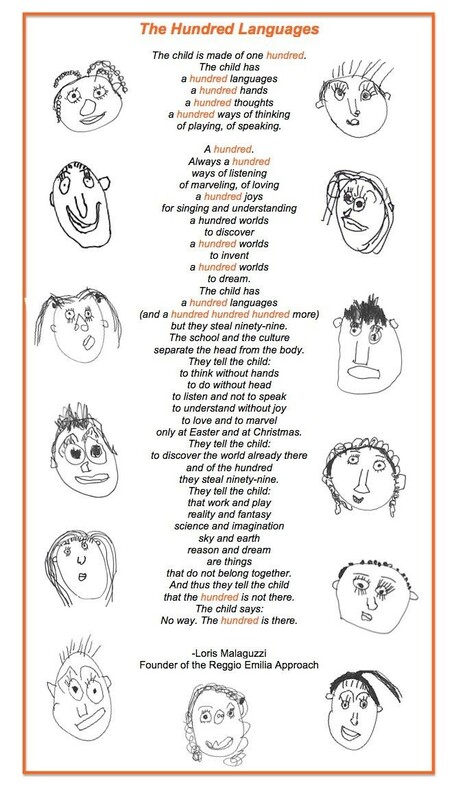 The Hundred Languages of Children is probably the most well-known aspect of the Reggio Emilia Approach. The belief that children use many different ways to show their understanding and express their thoughts and creativity. A hundred different ways of thinking, of discovering, of learning; drawing and sculpting, dance and movement, painting and pretend play, modelling and music, each one of these Hundred Languages must be valued and nurtured. These languages, or ways of learning, are all a part of the child. Learning and play are not separated. The Reggio Emilia Approach emphasises hands-on discovery learning that allows the child to use all their senses and all their languages to learn.